Disclosure: I received the following for review from Oridel through Tomoson. All opinions are my own. I am trying to take care of myself a wee bit better this year and part of that includes skincare. I recently went with a friend to pick up new makeup and I was in awe of how much she knew. Primarily because I have a quick <5 minute routine in the morning, I didn't realize what a difference the extra 2 minutes with mascara makes. 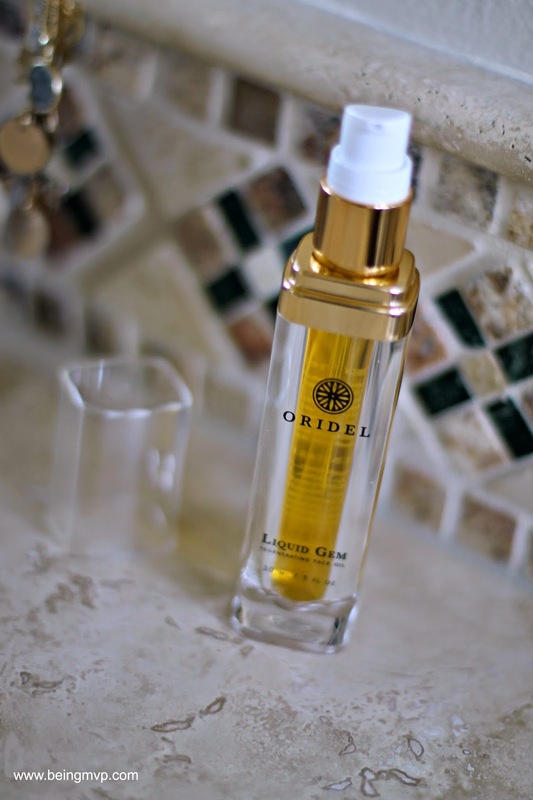 Makeup looks much better on a good foundation so I was excited to try Oridel's LIQUID GEM™ Regenerating Face Oil. The weather has been dry, cool and warm. It's not constant so my skin has been at its best. I've never used face oil before so it was a new experience. The LIQUID GEM™ facial moisturizer uses the healing processes of natural botanicals to bring your skin a warm dewy glow that seems to shine from within. Just one pump from this bottle can significantly soothe your skin, and especially skin damaged by the application of drying retinol treatments or other medications. Yet it is light and refreshing, does not feel oily or heavy, and has been specifically formulated to have a pleasing aroma that won't overpower the senses. I've been using this oil for several days now and have noticed a difference in the appearance of my skin. It's moisturized and supple looking even with just the one pump. Just apply to face and neck day and/or night. Even though the moisturizer is jam packed with 15 best natural herbal oils*, my face doesn't feel too oily. 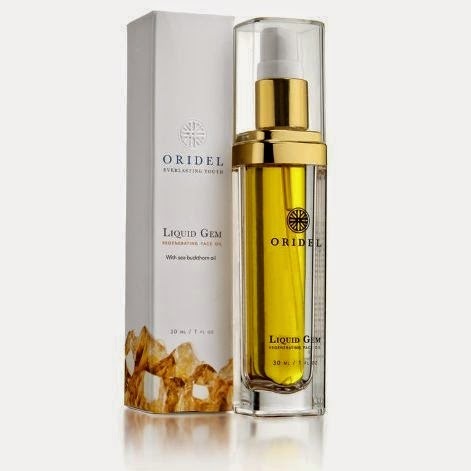 Each bottle also contains a faced Citrine stone to enhance the powers of the botanicals. I don't know that much about gems and their powers but it is interesting plus you get a pretty semi-precious gemstone! *Apricot Oil Oil, Argan Oil, Arnica Oil, Avocado Oil, Borage Oil, Calendula Oil, Carrot Seed Oil, Chamomile Oil, Evening Primrose Oil, Jojoba OIl, Neroli Oil, Rosewood Oil, Sesame Oil, Sea Buckthorn Oil, Vitamin E Oil. Citrine is said to be able to warm, cleanse and energize the body, purify the system and help to counteract the toxic effects of modern living. Just as bringing natural sunlight into your space is conducive to maintaining a healthy, life-affirming level of positive energy, including Citrine in your skin treatment can bring you the warmth and glow you have always been seeking. What's great about this face oil is that it can be used by so many different skin types whether you have had facial procedures, biopsies, acne and/or rosacea, sensitive skin and more. I am curious to see how my pores look after using this product for a couple of months! Do you want glowing and happy skin? Have you tried face oils? 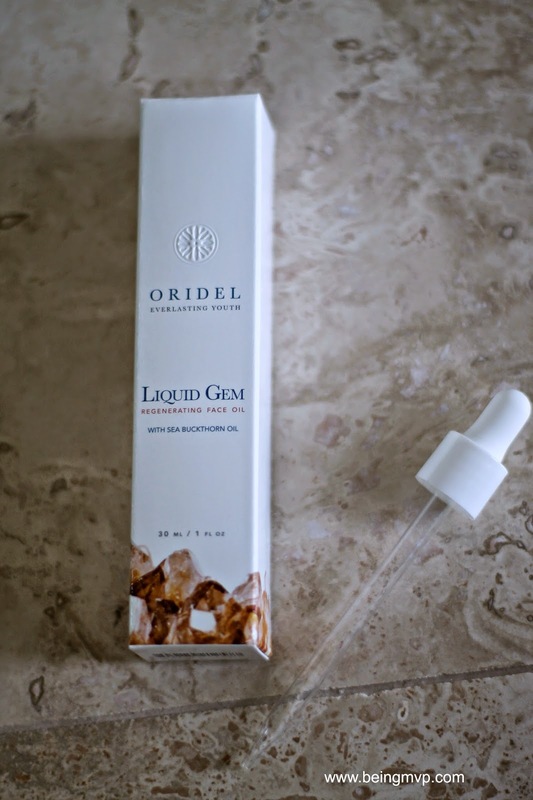 One winner will Receive Oridel® Liquid Gem™ Regenerating Face Oil! I would like to try this face oil because it sounds like it has some good anti-aging properties. I'm getting to the age when I need to start adding some anti-aging product to my routine! I love that it's organic and chemicals-free. I like that it is organic and at 33 I need to start worrying about anti aging stuff! I most want to try it because it has no harmful chemicals. I love that this is organic and made with REAL products! I would like to try this because it would be extra mild hydration for my winter dry skin. I love facial oils! I want to try this one. I would love to try this because of its ability to quickly penetrate the skin. Sometimes I hate putting creams on because of the time it takes to blend into my skin. I Like that it Moisturizes & Softens While Repairing Damaged Skin .. I would love to try this as i have extremely dry skin on my face and in and around my ears. I have to use a moisturizer every day. This is something i have not tried yet and it sounds like this could really help me with my skin hydration. Perfect for ALL skin types. Especially great for those with very sensitive skin. I want to try this because it does not contain any harmful chemicals! I would love to try it because it delivers extra hydration and reduces the appearance of aging. I love using oils and would love to try it because there are no harmful chemicals. I want to win this because I have always wanted to try an oil moisturizer. Also I have extremely sensitive skin and they say this is good for it. my face needs some tlc and i believe in using an oil moisturizer for skin problems. I want to try it because its something new and sounds like something I could like. I would like to try this product because my pores are really big. I have sensitive skin around my eyes, so this looks great. I would like to try this oil, and it has anti-inflammatory properties in it. This would help to calm down my dry, sensitive skin. I like that it works well with sensitive skin, because my skin gets irritated very easily. I like that it uses the natural healing processes of botanicals to bring a glow to your skin. I want to try this amazing oil because that is great for sensitive skin and has no harmful chemicals. I would love to try it because my skin is always very dry, and sensitive to many other products. I very much like the ingredients that it contains and the lack of chemicals, as well as the properties that citrine contribute. I like that it's perfect for all skin types. I want to win this product because the product is great for those with very sensitive skin. I would love to try this I have really sensitive skin so I think this may work for me. I want to try because I have sensitive skin and this would be great for me! I want to try this because it doesn't contain any chemicals. Also because my skin is very dry. My skin is so dry this winter. This sounds like the cure. I like that it's good for sensitive skin. I think this is really cool and we as a family have sensitive skin. I would like to win it for my wife. It sounds like a great facial moisturizer. I want to try this since it is good for any skin type, has anti inflammatory properties, and works good with sensitive skin. Anti aging is good too! I would love to try this because my skin is very sensitive! I would love to give it a try. My skin is sensitive as well.